The new joint venture gives Rheinmetall a 55% stake, with BAE owning the rest, and will be based at the UK firm's factory in Telford, Shropshire. Called Rheinmetall BAE Systems Land, the venture will produce the British Army's new infantry vehicles. 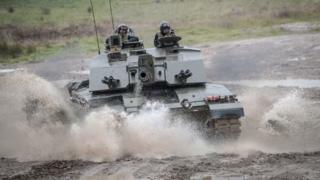 BAE's Land UK is competing to upgrade and maintain the Challenger 2 tank. About 400 people work at the main Telford factory, and at sites in Washington, Filton and Bovington. The new venture will not include Land UK's munitions and technology interests. BAE said the combination of Rheinmetall's military vehicles technology and products, together with BAE's capabilities, would create a European market leader in the military vehicle sector with the potential to create new jobs in the UK. Jennifer Osbaldestin, managing director of the Land UK business, said: "Joining forces with Rheinmetall in the UK provides renewed purpose for our vehicles business and allows us to deliver products, services and technology that help land forces excel in their vital roles." The UK operation, which also maintains the Warrior armoured vehicle, generates revenues of about £60m a year. Ben Hudson, global head of Rheinmetall's vehicle systems division, said: "The combined capabilities of our two great companies will offer our customers a comprehensive portfolio of military vehicles and associated technologies both now and into the future. "We are proud to invest in the UK and expect to substantially grow the current business and the Telford manufacturing facility over the coming years." Rheinmetall already leads a consortium, called Artec, that will build the new Boxer armoured vehicle for the British Army. The UK government has said that 60% of the value of the programme must be delivered in the UK, and BAE said the new joint venture gives it a central role in the contract.